Hundreds of people have gathered to pay their respects to the late Cranberries singer Dolores O’Riordan in her home city of Limerick. Large crowds gathered for the event ahead of her funeral on Tuesday. 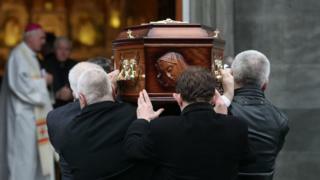 Hundreds queued outside St Joseph’s Church, where the singer’s open coffin is lying in public repose until 16:00 GMT on Sunday. This is the public’s first opportunity to see her body. O’Riordan died suddenly in London last week, aged 46. Many of those waiting carried yellow flowers such as daffodils, which they said represented sunshine. In remarks carried by broadcaster RTE, Bishop of Limerick Brendan Leahy said the singer was a deeply loved and cherished daughter of the city, and a convinced advocate of living life in truth, love and peace. Her remains will later be taken to a funeral home in nearby Ballyneety, where she will lie in repose on Monday evening before removal to St Ailbes’ Church in Ballybricken, where a funeral mass will be held on Tuesday morning. The funeral service will be followed be a private burial attended by her family. Local radio will broadcast the funeral service live for those unable to attend. The Irish Times reports that she will be buried next to her father Terence, who died in 2011. O’Riordan was discovered unresponsive in her hotel room in London on 15 January. Her publicist issued a statement saying that while she had been in the city for a studio mixing session with her other music group, D.A.R.K., she was also due to meet representatives of the BMG record label “to discuss plans for the release of a new Cranberries studio album”. An inquest into O’Riordan’s death, held at London’s Westminster Coroner’s Court, has been adjourned until 3 April while the coroner awaits test results.